Over the last few years, automakers have made leaps and bounds in the areas of innovation and technology, offering anything from entertainment to increased safety for their customers. Recently released information reveals that GM’s next investment is in Powermat Technologies, what will allow wireless smartphone charging in select models. Learn more about GM’s plans to provide more innovative features in their lineup for 2014. A ccording to the CEO of Powermat Technologies, Ran Poliakine, General Motors is set to begin offering wireless charging features for smart phones. This technology will initially not be made available in all GM models. This technology makes it possible for users to charge their smartphone battery without plugging it into any cables. Instead, drivers can place their phones and other mobile devices on top of a Powermat surface for charging. The devices used must have built-in technology that allows for recharging in this manner, or the user must use a special case made for wireless recharging. General Motors is also an investor in Powermat Technologies, making a $5 million investment in 2011. Coinciding with its announcement, GM first stated that it would include the Powermat products with select vehicles, initially set for 2012 but pushed back a few times since. GM will be the first auto manufacturer to integrate a Powermat into any of their models. This latest feature comes as GM tries to stay pace with Toyota as the Japanese automaker recently began including a similar system with their 2013 Avalon models. The Chrysler Group is also offering a similar feature in select 2013 compact Dodge Dart models. 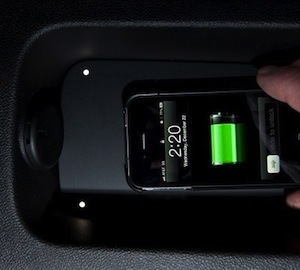 The use of wireless charging technology in cars is expected to skyrocket in the upcoming years. In 2012, global shipments of wireless style charging devices was a mere 5 million units, but by 2015 that number is expected to soar to 100 million units. The technology comes in response to consumer demand and also appears to be very simple for users. Phones that contain the wireless charging coils can be placed on the Powermat surface without any special considerations. Devices will receive electricity from a magnetic field and the charging time is about the same as offered by wired chargers. In Aug. 2013, Ran Polianke, CEO of Powermat Technologies Ltd. told Bloomberg news that select 2014 GM models will begin to incorporate wireless technology. GM has yet to confirm this report. Author Jason Lancaster enjoys keeping up with the latest car technologies and is eager to see GM’s latest wireless in-car charging feature in action. When he is not writing about new technologies, he works with GMPartsOnline.net, a site that sells OEM GM parts online at wholesale prices.